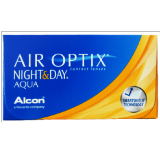 Air Optix Night and Day is a brand of monthly disposable contact lenses manufactured by the global giants CIBA vision. Air Optix Night and Day contact lenses offer a broad range of features which are aimed at offering a comfortable fit to the user. This includes breathable lenses, advanced designs and revolutionary technology. Air Optix Night and Day contact lenses are FDA approved and are an often recommended option with eye care practitioners. The lenses can be ordered online here with an up to date prescription. Extended Wear: Air Optix Night and Day contact lenses can be worn continuously for a maximum of 30 nights. This means wearers do not have to worry about lens cleaning during the period. However, not every one may be able to reach the maximum period. An eye care practitioner may recommend a shorter schedule based on the results of a preliminary examination. Cleaner Lenses: Because these breathable lenses can be worn constantly for 30 days they do not need to cleaned or disinfected regularly when they are in your eyes. Users who remove their lens before the replacement time expires will however need to clean and disinfect their lens before reinserting it. Moist Surface: Focus Night and day contact lenses are manufactured out of the fluoro-silicone material known as Lotrafilcon A. 24% of the material constitutes water which ensures that the surface of the eye always remains moist despite constant eye rotation and blinking. Breathable Lens: Focus Night and Day are designed to deliver a steady flow of essential oxygen to the eyes. Compared to other hydrogel brands, Focus Night and Day allow 600% more oxygen through the lens. The eyes are therefore never starved of oxygen, ensuring a comfortable and natural experience. The steady flow of oxygen also reduces the risk of irritation. Focus Night and Day contact lenses are designed for people who prefer the convenience of using contacts over glasses. They are ideally suited for people with active lifestyles who are constantly reading or working. Designed to be worn even during naps, Focus Night and Day lenses allow workers to transition smoothly between their office and home. Focus Night and Day lenses are so comfortable that some people actually forget they're wearing them. At Contact Lenses Online, buyers are guaranteed to get the best quality lenses for their needs. Contact Lenses Online offers discounted prices on their Focus Night and Day contact lenses. Contact Lenses Online is also affiliated with close to three dozen different Australian private health funds. This means that online shoppers can secure rebates on many of the purchases made within the site. Even though focus night and day lenses are designed to be worn constantly within the schedule window, it is not safe to wear these lenses while swimming or taking a bath. Doing this can increase a person's risk of infection. Contact lenses should be removed if a person feels consistent pain or discomfort. Focus Night and Day contact day lenses should never be worn beyond their replacement date. This can lead to an ocular issue such as eye ulcer. Focus Night and Day contact lenses can be used to restore ocular issues to near perfect eye sight. Before buying Focus Night and Day lenses, patients need to consult with their optometrist. An eye care practitioner will be able to prescribe the right lens based on a patient's lifestyle and needs. Patients who already have prescriptions are encouraged to still return for periodic eye examinations. Routine eye examinations are an essential way of preventing vision issues.